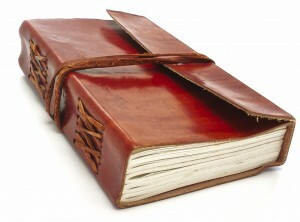 Advantage Book Binding has the ability to make the custom leather book products to meet your needs. In addition to leather binding hard cover or soft cover books, Advantage Book Binding can make elegant custom leather wedding and funeral guest books, leather menus, leather holders for golf score cards and much more. A leather binding adds a touch of class and personalization to any book item. Advantage Book Binding uses the best custom leather to bind your journal, Bible, or other book item that you want customized to perfection. Whether for business or personal use, you can get leather monogrammed to make it even more professional. Leather can provide an old world scholarly look to new and old books alike. Leather bound books can make your coffee table, bookshelf, or office feel cozy yet professional and Advantage Book Binding will make sure your books are bound in a timely and professional manner.